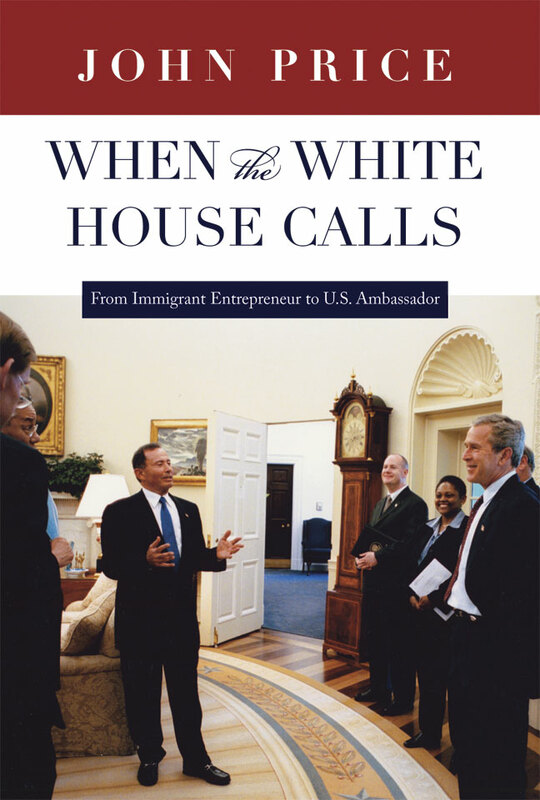 When the White House Calls tells the life story of John Price, one of Utah’s most prominent citizens, beginning with his birth in Germany through his years as a successful builder and real estate developer—with business interests in broadcasting, manufacturing, distribution, and banking—to his life as a diplomat. Born in Berlin on August 18, 1933, Hans Joachim Praiss was five years old when he and his family fled Nazi Germany in April 1939. The family found temporary refuge in Panama, finally arriving at Ellis Island in September 1940 and settling in New York City. Following the advice of a professor at CCNY, Price traveled west to fulfill a geology fieldwork course requirement, but upon seeing the snow-capped mountains surrounding Salt Lake City, knew he would stay. He earned his Bachelor of Science in Geological Engineering from the University of Utah in 1956. He practiced in that field before tiring of the often rigorous travel requirements and the desolate nature of the work. He soon turned to new opportunities. Years later, after operating successful business enterprises throughout the Intermountain region and nationally, and serving on numerous local, state, and national boards, Price had become the consummate entrepreneur, businessman, and community leader. He was ready to serve his country when the White House called. In February 2002 he was sworn in as U.S. Ambassador to the Republic of Mauritius, the Republic of Seychelles, and the Union of the Comoros, three Indian Ocean island nations off the east coast of Africa, where he served until 2005. In this telling autobiography, John Price focuses on his years as an ambassador and includes his thoughts on the future of sub-Saharan Africa. The account of his service as a diplomat offers readers a view of the daily life of an ambassador—the protocol for official meetings with heads of state, the routine of the office, the process of handling official communications, and the intricacies of diplomacy. More than that, in a world concerned with the global war on terror, he reflects on the three island nations where he served and on the region’s increasing strategic importance to the national security of the United States. In the years since the 2001 attacks on the World Trade Center and the Pentagon, the al-Qaeda movement has grown and its members have dispersed throughout the world, including the region known as the Horn of Africa and East Africa. Price calls attention to the vulnerability of sub-Saharan Africa as a haven for terrorists, and the critical need for our engagement of this desperate continent with economic development, health care, and education to counter this threat. His concern for this region of Africa is carefully articulated in the text, as well as in interviews (included as appendixes) with notable country leaders. When the White House Calls is a compelling story of the American Dream realized, and the importance of service to country. This is a book that will both educate and inspire young people, their mentors, and others, as they work to make a difference in the world. John Price has spent considerable time in sub-Saharan Africa, both prior to and since his ambassadorship. He currently lives in Salt Lake City with his wife Marcia. They have three children and eight grandchildren.